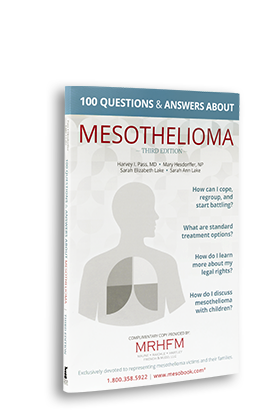 Home > Mesothelioma Information > What is Mesothelioma? 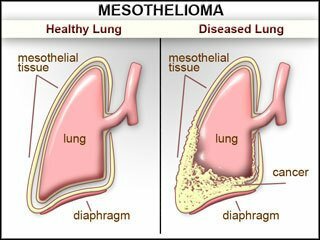 Mesothelioma is a cancer found in the lining surrounding the lungs, the stomach, the heart or the testicles. This cancer takes its name from the name that is given to this lining - the mesothelium. The pleura is the name for the mesothelial tissue surrounding the lungs and lining the chest cavity. If the cancer is in this lining, it is called "pleural mesothelioma." 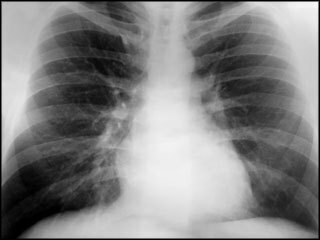 Pleural mesothelioma is the most common type of mesothelioma. The peritoneum is the lining that covers most of the organs in the abdominal cavity, while the pericardium is the lining that covers and protects the heart. If the cancer is in either of these areas, it is called "peritoneal mesothelioma" or "pericardial mesothelioma." However, there are many known cases of people developing mesothelioma at an earlier age. Often these are the sons and daughters whose parents were exposed to asbestos and who unwittingly brought the invisible dust home on their clothes or who did home remodeling projects and used products, such as joint compound, that contained asbestos. In some cases the child was around the parent as the parent changed the brakes - lined with asbestos - in the family car. This is called secondary exposure to asbestos.